Former IBF world welterweight champion Kell Brook will make his debut at light-middleweight against Sergey Rabchenko in Sheffield on 3 March. Briton Brook, 31, has not fought since losing his world title and breaking his left eye socket against Errol Spence Jr in May. Belarus' Rabchenko, 31, has won 29 and lost two of his 31 fights, while Brook has a 36-2 record from 38 bouts. "My focus is on becoming a two-weight two-time world champion," said Brook. "Rabchenko is a dangerous fight for the return but I want to jump straight back in at world level and I think our styles will gel for an electric fight. "I'm already deep in camp and I can't wait to feel the atmosphere again in my home town." Brook broke his right eye socket in the defeat by Gennady Golovkin in September 2016. Rabchenko, who is ranked number seven with the WBC, beat Brook's former stablemate Ryan Rhodes to win the European title in 2012. "I'm really looking forward to this fight with Kell Brook and it's going to be a war," said Rabchenko. "This is a high-profile fight in the division that has always been mine, and the winner will go on and challenge for the world title. It's a must-win fight for both of us." 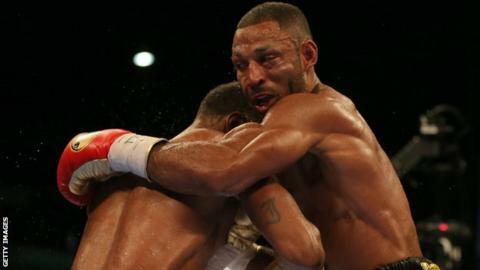 The fight, which will be held at Sheffield Arena, represents a step up in weight for Brook, from the 147lb welterweight division to 154lb at light-middleweight.